The chair has a new dress! Or at least the chair has a new cover, let us not get too surreal. 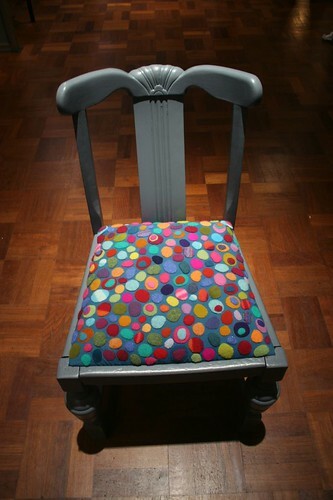 And I made a new set of pictures on Flickr of the felt pebble fixation which has lead to this chair being decorated thus. It got loads of compliments at the Eco Design Show in Liverpool over the weekend. A pound for every enthusiastic comment would have made me a rich woman! 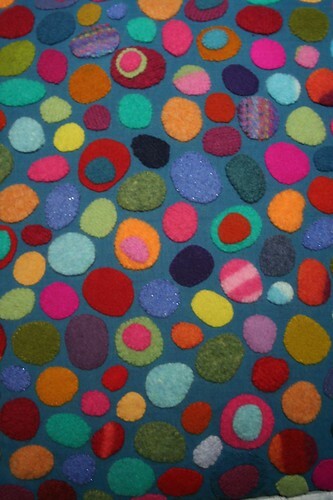 I do love to make people happy simply at the sight of some fabric sewn to some other fabric. Hopefully it will one day make someone SO happy that they have to buy it. Or at least commission their own. In the meantime it will make my studio happier and brighter and bring joy to all the work experience students who will be coming to work for me over the next few months*. And you guys too, I hope. The chair of happiness. * they will need it, poor loves mostly get to do ironing and cutting out circles. Sometimes pebbles, but mostly circles. « Staring blankly into the distance. It is fab, but I would feel guilty sitting on it. However as decoration, it might make me less likely to dump stuff on it, which is what I normally do to my chairs. It just needs a country house to reside in, where there are 17 other chairs to choose from! Saw this on craftgossip – this is amazing! I'm very tempted to recover a chair today…wish I had time! You've definitely inspired me – thank you! I add my enthusiastic comment to the pile — it looks so inviting and cheerful! I didn't know a chair could be uplifting, but somehow you've managed to make that happen! I love it! Gorgeous and fun! I'm thinking of a matching foot-stool…!You are inspiring! Oh my gosh! This is awesome! I have a chair sitting right next to me that I've been waiting to recover and THIS could be the ticket! Thanks for the amazing idea. OK, so I got so excited that I forgot to ask: Do you a tutorial somewhere that shows this technique? I'm such a visual learner…..Thanks. I’m going to use your idea for pillows!